Lincoln Health System (LHS) is pleased to announce Ear, Nose, and Throat Associates of Middle Tennessee, P.C. has opened an office in the Lincoln Medical Center Medical Plaza located at 108 Medical Center Blvd. in Fayetteville next to Lincoln Medical Center. Ear, Nose, and Throat Associates of Middle Tennessee, P.C. diagnoses and treats disorders of the ear, nose, and throat and provides hearing evaluations, hearing aids and related amplification products. The practice which has been treating patients for more than 25 years, consists of ENT-otolaryngologist Domenic Canonico, MD, and audiologists Robin Baker, Au.D. and Emily E. Jones, Au.D. “Dr. Canonico has been a member of the medical staff since 2017 and utilizes Lincoln Medical Center for surgical care for his patients. 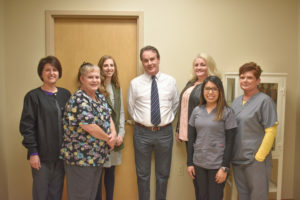 We are excited to have Dr. Canonico and his practice physically here in the community to help us provide specialty health care for our community members closer to home,” stated Candie Starr, Lincoln Health System CEO. The ENT office will be open at the Fayetteville location every Wednesday and Thursday from 8:00 am – 4:30 pm with plans to include Tuesday clinic hours in the future. To schedule an appointment at the Fayetteville practice, please call 931-684-3504. Lincoln Health System (LHS) is a county-owned, non-profit health system located in Fayetteville, Tennessee. The health system’s humble beginnings began back in 1916 when the area’s all-female Alpha Kappa Club made it their mission to lobby for a much-needed hospital in Lincoln County. In less than 12 months, the vision became a reality and Lincoln County Hospital opened its doors on April 25, 1917. One hundred years later, Lincoln Health System is still serving the community. LHS consists of a 59-bed acute care hospital, an ambulance service, long-term care and skilled care facility, home health and hospice agency, and freestanding outpatient rehabilitation and wellness center. For more information about Lincoln Health System its facilities, medical services, and physicians, visit www.LincolnHealthSystem.com.